The container ship Red Cedar lost 15 containers during storm in North Sea near Texel, Netherlands. The vessel was en route from Hamburg to Antwerp, but was caught by rough weather, which caused falling of 15 container overboard. According to the cargo list, the units were loaded with non-hazardous goods. 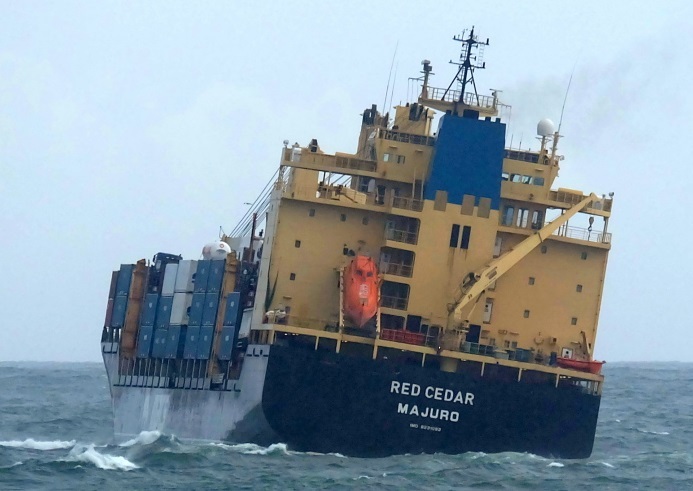 After the incident, the container ship Red Cedar changed her course to secure the remaining container on board and to improve stability against strong winds. The storm cause some problems for the ship, which headed to IJmuiden and reduced speed near the coast. The crew did not requested assistance from the local authorities and proceeded by own power. To the reported coordinated, where the containers were lost, was dispatched salvage tug Guardian, which should spot the lost containers. The local authorities sent navigation warning to seafarers for danger near Texel. Fortunately during the accident there were no injured people and no reported water pollution. The container ship Red Cedar (IMO: 9231092) has overall length of 193.00 m, moulded beam of 28.00 m and maximum draft of 8.00 m. The deadweight of the carrier is 30,537 DWT and the gross tonnage is 23,132 GRT. The ship was built in 2001 by Xiamen Shipbuilding Industry yard in Xiamen, China. The owner and operator of the container vessel Red Cedar is German company Vineta. That were all my personal belongings that went overboard in one of the containers. So sad and clueless what to do. The company has not refunded me yet, neither have I heard of them or their insurance. Any advice who or what can help?